...you'll just have to come back to Philadelphia, because there are even more 'treasures' to seek and find. There are about a dozen 'mansions' in Fairmount Park. Most of them are indigenous to their site and they were indeed country estates two centuries ago. Now they are for the most part house museums, full of valuable artifacts, and still barely visited -- perhaps it should stay that way though. 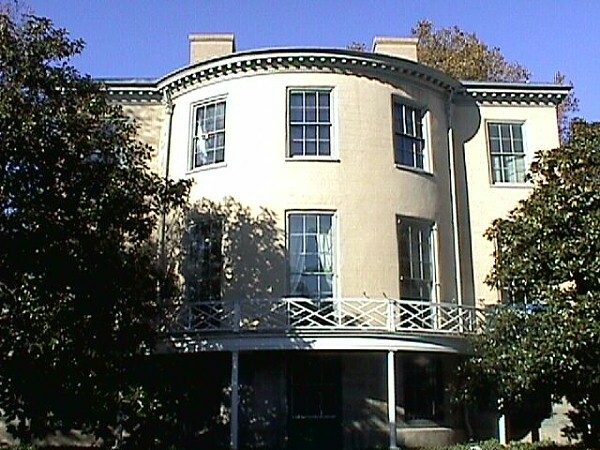 Lemon Hill, close to the Art Museum, is easily one of the finest Regency houses north of the Mason-Dixon line. 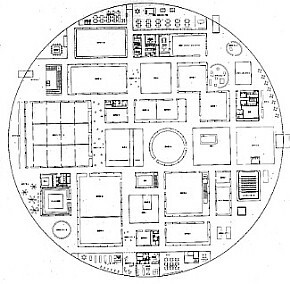 It's three oval rooms stacked on three floors atop each other are the precedent for the oval rooms at the White House. I believe the main oval parlor of Lemon Hill is one of the best rooms in the United States. Mount Pleasant is a true Georgian mansion, complete with symmetrical out buildings flanking the main facade. What's great about this place is that while it is so 'English' it is at the same time so 'American'. It's like the two natures were at one time so connected, which they actually were, and this house captured that (brief) co-existence. When I was in architecture school in Philadelphia in the late '70s, historic homes weren't really the thing, so it's more in my adulthood that I've gone out to look at these places. 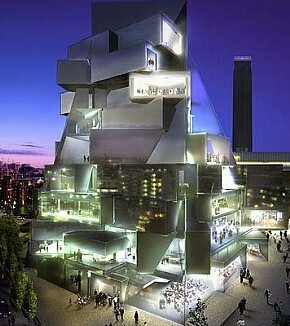 I'm not exactly sure why, but I walk away more impressed after each visit or tour. 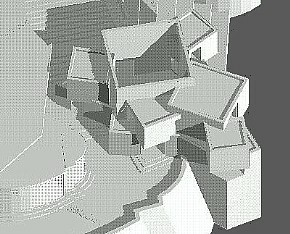 Maybe I'm gradually getting better at recognizing what really good architecture is. 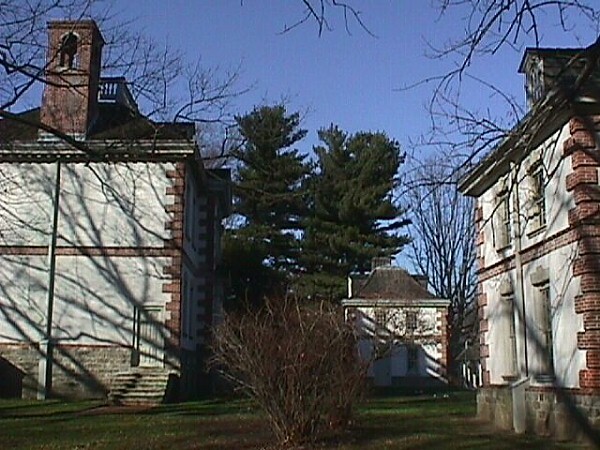 There are many historic 'mansions' in Germantown as well, which is now an old established neighborhood of Philadelphia, but originated as a separate town, settled by Germans just a few years after William Penn. Stenton is a very old house/mansion in lower Germantown, and it is the estate of John Logan, William Penn's secretary. Robert Venturi, in a 1984 Philadelphia Inquirer Sunday magazine piece, said Stenton was among his favorite buildings in Philadelphia. I can still remember the next day at work (in an architect's office) everyone (including myself) asking, "Where's Stenton?!?" 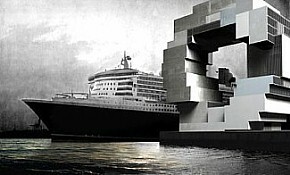 Albeit superficial, there is nonetheless a strong similarity between the design of a portion of Acropolis Q (1990) and the new design for the Tate Modern 2 (2006) by Herzog and de Meuron. "A further study of the main house resulted in two radical options: a vertical and horizontal house, both based on the same configuration. ... By turning our initial proposal 90 degrees a vast potential was discovered in which each space can have its own personal relationship with the landscape. What used to be a conventional patio becomes a centrally located multi-level living space which gives the inhabitants an unprecedented special experience and at the same time fits the very specific demands of the program." 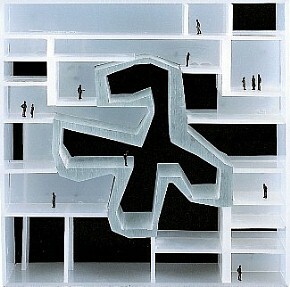 --description of OMA's Ascot Residence (2003). One easy way to conceptualize a new paradigm is to invert the "set of assumptions, concepts, values, and practices that constitutes a way of viewing reality". ...or just practice the twist in front of the mirror[-copy plan]. "I'm secretly working on Plan Atypical"